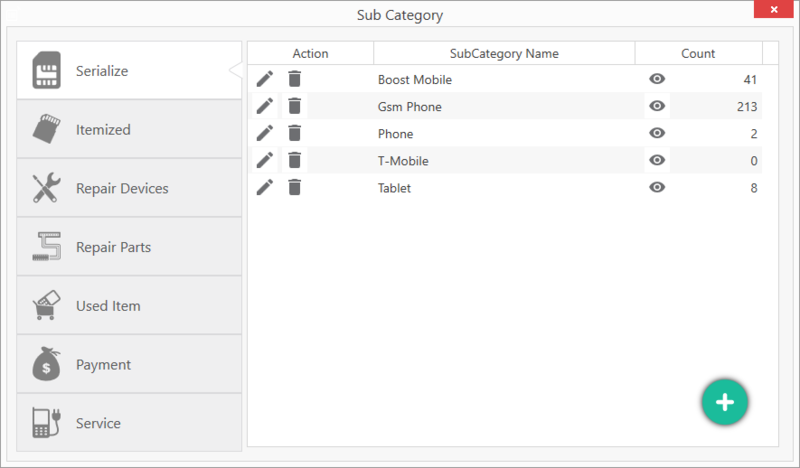 Manage your categories by organizing your products and services and assigning them different categories. CellSmart POS has seven categories which include serialized, itemized, repair devices, repair parts, used items, payments and services. These categories are used throughout the software to help you in keeping track of the day-to-day activities in your store. Clicking on the Manage categories icon. Selecting any category and click on the green plus icon. Selecting your main category by clicking on the drop down menu. Entering a new category name in the categorty name field. Click save to create the category. The Serialized category contains all the products that have a unique ID/ Serial/ IMEI number. This allows the software to identify and differentiate products from each other. Examples of serialized products are phones, tablets, ipods and etc. The Itemized category contains all the products that do not have any serial or IMEI numbers assigned to them. These products are general items and are not different from each other. Examples of itemized items can be chargers, cases, headphones and etc. The Repair devices category is category for repairs. It contains all the repair devices that you repair for customers. For example, if a client comes in your store to repair his/her iphone 6 cracked screen and you've never repaired an iPhone 6 before. You will simply create a new repair device and add it to the repair. The repair items category allows you to create repair parts that are being used to repair your repair devices. For example, if your repairing an LCD screen for a phone that you have never repaired before, you can create a new repair item naming it its exact name so that when ever you repair the same device you can use the same repair part for the repair. The used item category contain all products itemized and serialized. You can purchase a used item from someone and save it in Cellsmart POS. All used items are listed separately than regular inventory items and you can sell them with a used code. The payments category is designed to store different payment carriers for Bill payments. (i.e Boost Mobile topup,Simple Mobile topup and etc.) These topup carriers products can be added to any transaction or put in an invoice separately. The Service Category allows you to enter products that are non-inventory for example if you charge a client to install an app in their smartphone, you can create a service product for that because it is non-inventory. Also, other services such as resetting a customer's phone or activating a phone can be created as services.